As some of you may already know, I'm a huge animal lover. I'll do anything to help animals, from aiding the ASPCA down to snatching a squawking blue jay from the mouth of a large Tom. (True story and the bird lived :) I'm especially attached to my pets, Angel, a fifteen-year-old Birman with only four teeth, Lizzie, a thirteen-year-old Cavalier King spaniel who is blind, deaf and diabetic, and our newest addition, Zoey, a passionate nine-month-old with a nervous bladder. My husband, Greg, daughter, Danielle, and I consider our pets as a part of our family. I'll always say, "Zoey, go give your sissy a kiss" or "Angel, it's not nice to bite your daddy." (Those four teeth are sharp!) Lizzie hasn't been getting up and around much lately except for her meals, which I sometimes bring to her. Our veterinarian assured us she isn't suffering from anything that causes her pain and if she can get around using her sense of smell, then she's fine. Phew! When we had her diabetes diagnosis the doctor told us to expect her to pass away last year, so every day more I have with her I treat like the gift that it is. Yesterday, we made our annual trip to Rulf's apple orchard's pumpkin patch. It's always so much fun to choose from the rainbow of mums, get our donuts and cider, select different canned jellies (this year we went with Red Jalapeño, Black Raspberry and Apple Cider), purchase a peck of Macintosh apples and refuel our local tapped maple syrup supply. 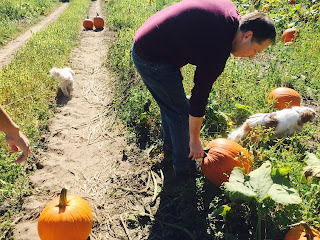 Best of all, we knew we'd get to do something we haven't done in a while since losing my other dog, Little Bit last summer and Lizzie's decline in health: take a pet with us for the wagon ride into the pumpkin patch. It's the highlight of the fall to see dogs bounding through the tangled vines, frisking with other dogs, and getting excited over just about everything. So, what a complete shock when Lizzie didn't return to her bed after eating and started barking at the garage door as we donned our shoes to head out. She rarely wants to leave the house, so why the ruckus? 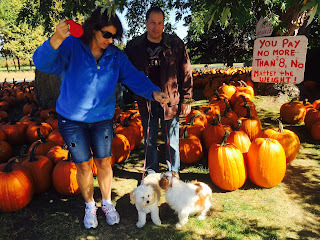 After some debate, (could a blind and deaf dog navigate being on a wagon ride and maneuver through a pumpkin patch?) we decided to take her with a "Handle with Care" policy. As it turned out, Lizzie didn't need us to hover over her. She must have remembered the smells of Rulf's from previous years because as soon as we got out of the car, she made a beeline for the spot where they give out free popcorn (her favorite snack) and actually tried to climb up the stairs into the wagon on her own! She was so happy to stand in the center of the wagon, the air whipping over her ears, then trot through the farm fields, sniffing everything! It was a beautiful day and another precious gift to have spent it with her. Her indelible spirit to enjoy every bit of her life, no matter the adversity she faces, is a true inspiration and a reminder to always think positively and embrace the good parts of our lives. By doing that, we can overcome anything. How have your pets made your life more positive? In what ways have they inspired you? 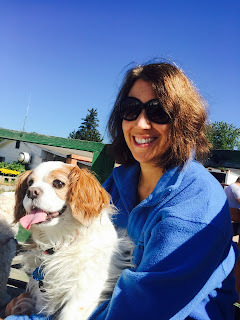 Please share your thoughts below; you know how much I'd love to hear them :) Oh- and in Lizzie's honor, I'm giving away an autographed copy of my multi-award-winning Harlequin Heartwarming novel, WISH ME TOMORROW, which features an adorable diabetic Cavalier King spaniel, Sweet Pea. Please include your email address with your comment if you wish to enter the contest. I'll announce the winner here, tonight, at 10 pm EST. I'm not so much an animal person (other than about my cats, who are really just people in fur), but I love Lizzie's story. She's a little beauty! Aw! Thank you so much, Liz :) xoxo She just warms my heart. I really love both dogs and cats. One of my puppies I had a long time ago ran under a bureau and hurt one of her eyes. We had her for over 11 years and she was able to only see out of one eye. She was such a happy dog. With such a loving pet mom as you, Debra, your puppy surely had a very happy life! It's amazing how animals care the most about love and family and don't let their disabilities get in the way. Thanks so much for sharing your thoughts on the blog! Pam! I'm in love with all of your beautiful pets, and most especially, Simba, What a beautiful little soul. She brought so much joy to everyone's life and inspired her dads, who also had disabilities, with her unconditional love. Pets are the greatest of gifts and I understand why she'd irreplaceable. Thank you so much for sharing your heartwarming thoughts about a topic that means so much! I have a disease that is called Reflex Sympathetic Dystrophy and without my girls I am not sure how I would of gone thru it. I have to take alot of meds and they are always so understanding. They are just so loving and the past girls and boys that we have had also have been the same. One her name was Kona and she was a rescue wow she was amazing. At the time I was getting alot of pain injections and come home out of it. She was a big dog and she would just lay next to me. That is how the 2 chihauhaus are now they know is a part of me is really having pain as they lick my leg or my ankle and even their lick hurts but I know they don't know that but they are giving love and trying to make me better. All of the pets we have had since i got this 25+ years ago have been gifts and so much unconditional loving . So without my girls and also my books I am not sure where I would be now. You're battle with Reflex Sympathetic Dystrophy, and the loving pets- Kona and your wonderful Chihuahuas- are an inspiration and a testimony to the fact that love conquers all. Books take you away from reality, which is a wonderful gift, but such big-hearted pets, make your reality more bearable and encourage you to keep going. Where would we be without our pet families? I wouldn't want to know. Thank you SO much for stopping by the blog today and sharing your uplifting story with us. I am an animal lover just like you, growing up we never had many pets around, but the previous two years we've had rats and they were a joy to have around. This summer we lost the last two of them and our life just hasn't been the same since. I still miss them a lot. Rats are such smart and caring animals and they always brightened my day. I love how animals care about you, they are always there for you and are never angry, not even when you have to force medicine down their mouth. They are so forgiving. The rats recognized our voices and Smarties learned to wait in front of the door for her cage when she wanted out. They loved to cuddle close to me and always read with me on the bed. They made my life better just be being there. After we lost our last two rat we haven't got any new pets, we're still getting used their absence, maybe in a year or so we'll take pets again, but we're not ready for new pets at this moment. oops Karen sorry I forgot to put my email ptclayton2@aol.com and thank you so much for reading my story. My mom lost her girl 1 yr ago and she is now by herself and i can say she was so much better when she had Tootsie. She loved how she was greeted at the door and also she was not by herself. Tootsie would sit right by her legs as she crocheted so when my pup Dexter passed away 2 weeks later we were both basket cases. About 4 mo later we went to the Humane Society and they had called me and told me they had a little one for me to foster. Well mom and i both fell in love with Daisy and when we have out Wed night girls crafting she comes to get me and she sees Daisy and just gets so happy. So when my husband comes to town to get me from moms house at night mom comes out on her deck and waves good night to the girls and they look up at her it is so cute. I am in tears right now. Thank you for sharing your day with Lizzie. It was like a visit from our Ginger (a King Charles/Peke mix that we inherited from my mother. I can't ever remember is she was Cavy or not.) She was the sweetest, gentlest (to humans) baby I have ever been around. We have had many dogs over the years but losing this wonderful girl and link to my parents was the hardest. May Lizzie live long and well. You made me cry, too, Billie. Ginger was a beautiful little soul and her connection to your parents made her sweeter still. 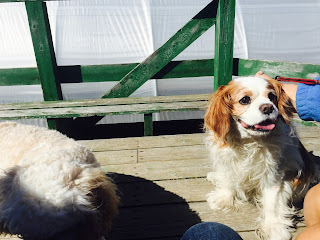 I know she's with them now :) I like to think of my other Cavalier King- Little Bit- waiting to great me with her helicopter tail spinning the clouds into a froth! Thank you for your encouragement with Lizzie. She just came down here for "breakfast" lazy girl - lol- but she tried to play a little which, for her, is barking and turning in a circle around her favorite bone while my puppy, Zoey, tries to sneak in. Very cute. Thank you so much for stopping by the blog and telling me about Ginger! We have had our dog for only a year and I honestly don't know why we waited so long to get Koko. Growing up we always had at least two dogs in the house. I'm a cat lover but allergic. Weird, I know but hey, its me. 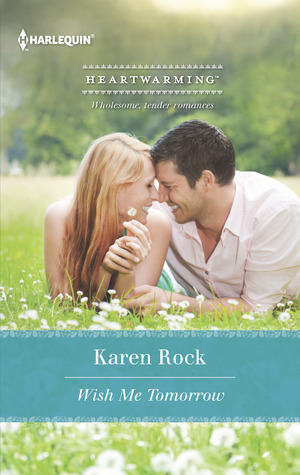 Loved your story and the wonderful photos, Karen. What a sweet story. So glad Lizzie got to make the trip. Dogs are wonderful people.